The following items are included in the rental rate; gas, electricity, linen, towels, Wi-Fi access, a welcome tray,hand soap, washing machine tablets, dishwasher tablets, washing-up liquid and starter toilet rolls. Short breaks are available throughout the year. Short breaks run from a Monday to Friday (4 nights) or a Friday to Monday (3 nights). Changeover day is a Friday or Monday. 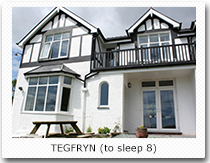 A fully refundable damage deposit of £100 is required per booking of Bryn Gwyn or Tegfryn. 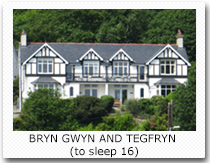 £150 is required for Bay View, Glan y Mor or if both Bryn Gwyn and Tegfryn are booked together. 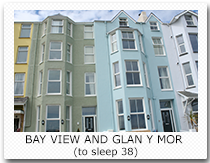 £200 is required if Bay View and Glan y Mor are booked together. The full balance of the holiday is payable at least 8 weeks before the holiday start date. Prior to this, a 30% deposit will be required to confirm any booking.